Rod Stewart said, “Every picture tells a story, don’t it?” Furthermore, the cliché goes that a picture is worth a thousand words. In this case, the axioms must be true. 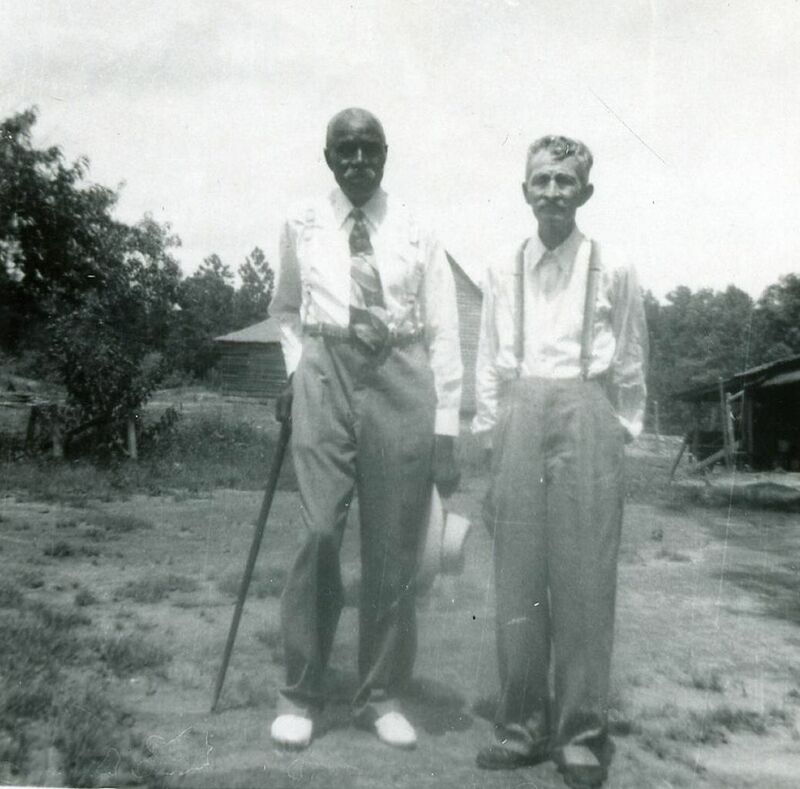 This picture was taken at a Cunningham Family Reunion in Oglethorpe County, Georgia in 1951. The man on the right is my great-great-grandfather Amos Blakey Cunningham. He was born in Oglethorpe County, Georgia in 1871, but his family moved to Texas in about 1880. He went back to Georgia for the first time on the occasion of this reunion. It was the first time he’d seen his sister Lizzie Burkhalter since the family left for Texas. The man on the left is Johnson Franklin Cunningham. He was named for Amos’s father, Johnson Franklin Cunningham. He was born in about 1868, also in Oglethorpe County, Georgia, to former slaves named James and Charlotte Cunningham. I believe that James Cunningham had been owned by Amos’s father, and I feel quite certain that Charlotte was. I posted about some of my findings previously, so I won’t duplicate the entire post here. I have always been told by Amos’s grandchildren, including my grandfather and his cousin Mary Elder, that when they were little, the two men in the picture were playmates. News broke recently that due to research efforts by Megan Smolenyak, Reverend Al Sharpton’s roots may be traced to a slave owned by relatives of Strom Thurmond. I found the story very interesting. I would like to find out what happened to the descendents of slaves owned by my own family, but I’m not sure how to go about it. First of all, the issue is sensitive, and rightly so, and I don’t want to offend anyone. Secondly, records are so sketchy, even after the Civil War. I would like to invite anyone who believes they have traced a connection to any of the lines I’m researching to contact me. I TOO AM A DESCENDANT OF THE HUFF FAMILY LINEAGE. MY GRANDMOTHERS FATHER WAS JAMES HENRY HUFF FROM CHATENOOGA TENNESSEE. I DON’T KNOW EXACTLY WHERE HE WAS BORN BUT WAS SAID TO BE IN GEORGIA WHERE THEY HAD THE BATTLE. THE MOST I COULD FIND WAS A FEW NAMES THATR I PRINTED FROM A WEBSITE. BUT I THINK GOING TO ANCESTRY WILL HELP ME FIND OUT MORE. IF THERE IS SOME WAY YOU COULD TELL ME HOW I COULD SEARCH PLACES I WOULD APPRECIATE THE HELP. MY GRANDMOTHERS FAMILY WERE SLAVE OWNERS AS WELL. Ellen, the Huffs who married into my family in the early 1800’s were from Oglethorpe Co., and my husband’s family, as far as I know, is not from the Chattanooga area. They lived in Williamson Co, closer to Nashville. Ancestry.com is a really good place to start. There were quite a few battles in Georgia — do you know whereabouts? What was your grandmothers full name. I have info on the Huff’s of Pike & Meriwether Counties. Hi’ this is Johnny tuck sorry it took so long but my grandmothers full name was sally Mae huff from Manchester Ga. Currently, I am doing some genealogical research for an individual who is in the direct lineage of James M. Huff or Oglethorpe, Georgia. Her ancestors remained in Oglethorpe after emancipation. Her link is through her mother. I will post additional information as soon as I arrange my data. Thanks for your posting. I’m super excited about the former enslaved Mary and her descendants. That would be great. Weird coincidence because Huff is my married name, but the Oglethorpe Huffs are relatives of mine (not relatives of my husband), as they married into my Cunningham/Anthony family from Oglethorpe County. Hello Dana,, just found this site looking for info on another family… I am not directly related to the Huffs, but have a great uncle who married into that family in Oglethorpe GA. A number of families including Huffs, McMahans, Stokelys, and Hopkins moved to Oglethorpe GA in the late 1860s. Most of them were prosperous families who had previously lived in East TN and were supporters of the Confederacy. East TN became pretty uncomfortable for former rebels after the war ended. If you are looking for ancestry of Oglethorpe Huffs you might find lots of relatives in Cocke County, TN or right across the state line in Western NC. I am interested in any further information on the African American connection I the Blackwater, VA and Tennessee area in the early and mid 1800’s. Any one who may have a connection, their information would be very much appreciated. I live in SC there are a number of folks searching descedands of slaves owned by their families. Middleton family of Summerville, SC. Wm Gilmore Simms family. Edward Ball of the Ball family, in fact he wrote “Slaves in the Family” “Sweet Hell Inside” about the slave holding Ball family and the current generation of the Ball slaves. A google search should provide contacts, who have experience in this research. The Huff’s that happen to be African American, may be able to trace their ancestry to Charles Hoff/Huff who is buried in Vesta in Oglethorpe County. He was the brother of My GGGG-grandfather, John Peter Huff, and my GGGGG-Grandfather Robert. He lived with a slave lady before the war and fathered many children with her, after the war they stayed together. He willed his land to his sons, but it was contested. It went before the Ga. Supreme Court and the will was withheld. I live in Athens, and meet many of my ancestors everyday. I love all my brothers and sisters be they of darker hue than myself or not. But I dare not tell them what I know… If you’ve watched the “African American Experience” on PBS, actor organ Freeman had a family linages the same as I have mentioned here above.. It appears “marriages” like these were more common than we think. My family name is Huff. I am african american. My grandfather met my grandmother in Tx. Im very interestes in finding out if our lineage started in Ga.
Hello Kandie, what part of Texas does your family come from? I am trying to locate African-American Huff family in TX. Thanks! Please contact me I too an a descendant of Peter Huff frorm Oglethorpe, Georgia. My email is yvonne_rbrtsn@yahoo.com. Charles,why sure you are right. My parents seem to be ashamed of their :(,therefore not telling us of their moms or dad’s. I have begun a search of my dad’s lineage,Herman Huff is all I have, born in Georgia,near a mountain,mom was indian. Never had info on who his dad was. Thank you for your sentiment. My hubby encourages me to have a DNA test done, ever had the test? I just thought you would like to know that I have seen a slave collar with the name jim Cunningham on it and below was the name ogden, I am assuming that the ogden name is the slaves name. I am searching for a time and place of this collar. And anyone else with Cunningham family line. I have done a DNA lest and my mother who is Afro-Carribean bears the surname Cunningham we had actually has a DNA match the the Scottish Cunningham lords I have been able to trace back to 10th century(Wernebald Cunninghame, 1st Lord of Kilmaurs) I started at Alexander Cunningham lord of Scotland. If you have a my heritage account. My tree is Cunningham and knight family tree. My Gt. Gt. Grandfather William Huff and two generations before him were slave owners in Goose Creek, I dont know the surnames now of there slaves. But in the will of his grandfather Thomas Burbage of Wassamassaw SC, he is given a boy Bill in 1843. My Gt. Grandfather John Justus Huff, Williams son married a Lizzie Driggers of Berkeley SC whose blood line was tri-racial steming from Manuel Driggus a Bantu Angolian set free in Virginia in mid 1600s. the family move south to NC and then SC in mid 1700s and settled as farmers and cattleman. up to 1840s my Driggers family were counted as free people of color and some even held slaves themselves. there were names given to the Driggers and other family kin of the same mix in the 1800s and up to 1900s in parts of Goose Creek and Summerville SC, Summerville Indians and Brass Ankles. I have taken forever to reply, and I’m sorry about that Barry! It sounds like your Goose Creek Huffs are the ones connected to my own family (not my husband’s, who as far as I know are a different branch). I had indirect ancestor who married into the Oglethorpe Co. Huffs. There is a narrative by a woman named Easter Huff who was a former slave on the Oglethorpe Gen Web site. Martha Clemons was an enslaved Woman. She gave birth to several children on that Plantation. The birth ledger from the 1850’s.documenting those births are in the Georgia State Archives. This Clemons line is the family of my paternal grandfather. His paternal grandmother mother’s people. I am also interested in the Huff line. That is my paternal grandmother’s – paternal grandmother’s line. (Her father’s- mother Catherine Huff was the daughter of a German Overseer and an Enslaved African West Indian Mulatto Women ” Jane’ . They were on the Humble or Hubble Plantation. After leaving another plantation. Please email me. You can find me on WordPress. Huff Arnold Reeves Milledgeville etc. He just had a family reunion for the Huff, Arnold and Reeves family line. We would like to find out more information on William and Jane. I remember hearing about the Humble plantation. If anyone has any info, please share. Thanks! I am also a descendant of William and Jane Huff. Their daughter Catherine was my great-great grandmother. You can reach me at chemarie204@aol.com. Hello Barry, Please contact me I too an a descendant of the Huff ‘s from Oglethorpe, Grove Creek, Georgia. My email is yvonne_rbrtsn@yahoo.com. I am looking for any infomation on any Huffs. My GG Grandmother was Tiny (Huff) Wells her husband was Loss Wells of Georgia. My GGG Grandmother was Maudy Huff not sure of her maiden name or her husband name. But I’ve manage to trace my family back to 1850 by the date of birth, but I’m still in search. Well I am the 5th generation descendent of William Huff (a German Plantation overseer) and Jane (a West Indian born slave). William and Jane started their family in Putnam County, Georgia and moved to Baldwin County, Georgia where they continued to raise their 14 children. Their 14 children are Albert, Catherine, Charlie, Polly, Pinkey, Delois, Louis, John, Nancy, Ella, William, Susan, Julia, and Camilla. Catherine Huff-Arnold is my Grt. Grt. Grt. grandmother. Catherine Huff then married and had son named Tom Arnold who married Rosetta Reeves Arnold and had a daughter Fleta Arnold Lewis who was my Grt grandmother who is originally from Mildgeville, Georgia. For over 20 yrs there has been a Huff-Reeves-Arnold Family reunion that is held bi-annually around the U.S. We are in the process of planning the 2009 Family reunion which will be held in New Jersey. I do not know if these are the Huffs you are looking for but there is a website for the Family reunion. i am doing family research and my ancestors the Huffs according to my aunt were the children of a german(jew)whose name might have been Huffman/Hoffman and he had children by a west indian slave.Polly their daughter may be my ggg grandmother. I am Janae’s cousin. My great-grandmother was Catherine Huff (Polly Huff’s older sister). Tell me more about your ggg grandmother Polly. Who did she marry and what were her children’s names? I am a descendant of a Catherine Huff whose father was a German overseer and whose mother’s name was Jane, a west Indian slave. Catherine was my grt-grandmother. She had a sister named Polly. 5th generation right here! My Grandmother is Arlene Huff..she’s the daughter of Howard “Pete” Huff and Mildred Coles! Oops! I meant 6th generation. My apologies! I haven’t been on this website for years but I was so…happy to see that you are the granddaughter of Arlene who I called Aunt Doll. Aunt Doll (Arlene) is the sister of my mom Beatrice Huff Threeths and their dad is Pete Huff. Who are your parents? 🙂 My name is Delvenia Threeths Fairbanks and my nickname is Deany. Nice to meet you Deany! So glad to hear from family! I was just looking at a picture of my grandmother and her sisters (my dad received the picture after she passed). My parents are GiGi and Darryl Thomas. Hope to hear back soon! Hello to you both, I am so happy to read your post. I am Arlene’s daughter so Star you would be my neice and Deany my cousin. I have been researching my lineage and it seems to end at Howard Huff and Mildred Coles. If you should find additional information about either of them, please post it. It’s so wonderful to know you are there and related to me. Hello, I stumbled upon this site by accident when I was looking up basketball information on my uncle. I am the granddaughter of Beatrice (Huff) Threeths. My mother is Lenore, her daughter, and Delvenia is my aunt Deany. Aunt Doll (Arlene) is my great aunt. Hi Anisa..Arlene is my grandmother,so that makes us cousins! Nice to meet you! Hope to hear back soon! Hi, my great great grandfather was Austin Huff, who lived in. Grove Creek. My research leads me to believe that his father was Richard Huff and a slave. Richards ancestors were from the Netherlands. Looking for more information on then. My email is yvonne_rbrtsn@yahoo.com. My advice, if you have any records that indicates slaves, post them online. As an African-american, finding these records are difficult. Many white families probably have them in their collections and not sure about what to do with them. That’s a very good point. I think it’s most likely done out of a sense of some shame or embarrassment over the actions of our ancestors in addition to not knowing what to do with them, but you are very correct in that finding the records, online or elsewhere, is often difficult. I am also a descendant from a slave (Janny) and a white slave master whose surname was Huff. I would appreciate any information you have regarding the family. Jamah, the first place to start is to interview the oldest members of your family — your grandparents and great-grandparents (if you have them). They can tell you a great deal. After you have learned as much as you can from them, you might want to check out genealogy sites online or visit your library to see if they are able to help. Good luck! I am looking to find information about part of my family. I am the descendant of an enslaved woman named Lula Huff, I do know she was from North Carolina and I was wondering if anyone knew off Huffs in that area or where I could find more information. I’m not sure about North Carolina Huffs, but there is a narrative taken from Easter Huff available via the Oglethorpe County GenWeb. It could be a place to start with your research. These Huffs did marry into my family at some point, but as far as I know, they are no connection to my husband’s family. the great great great grand daughter of Jane and William Huff, great great grand daughter of Catherine Huff Arnold and Edlar Aleck Arnold and great grand of Rosetta(Duval)Reeves Arnold and Tom Arnold grand of Fleta and Orian, and the first born of their first born and my mother whose legacy is equally illustrious and as lengthy but from the shores of the Gullah Geechie clans of South Carolina the Jones who arrived in St Stephen from Barbados and the Rivers who owned land along the Santee River before the building of the dam, when the Town Trial existed . I read all of the post and your Blog, I was wondering if you could cantact the writer listed as Vee, and give her my email address. I am also searching the Baldwin county Reeves and was trying to get back past an Arthur Reeves, his death record did not list parent,Any information would be appreciated. This is a wonderful blog and I am sure you have helped people who would have never found info on their ancestors May you continue to be blessed as you bless others. Rosa I .only just seeing your post from several years ago. Please contact me. There is a wonderful legacy of the Reeves from Milledgeville Georgia. I found records that document that some of the Reeves were on the Bar Azor a ship that returned to Africa 1876 leaving from Charleston Harbor South Carolina. My ancestors Spencer Reeves and his family were on that vessel. They returned a year plus later on the Monrovia to New York Harbor and back to Millesgeville. They were in Sierra Leone and Liberia. I never knew any.of this. Yet while researching something in Theology completely separate from this. I was led to a book which then contained a shirt paragraph of a Spencer Reeves of Milledgeville in South Carolina 1877..Following up on this I unearthed a gold mind. Vee, you have some very interesting information abt. your family. Our Arnold research has been at a dead end for abt. 20 yrs. going back to William Needham Arnold. He married an indian girl (at least 1/2) named Serena Foy. Info. passed along says he was much older that she. They married in 1805 and was in Tattnall Co., Ga. at his death in 1805. Through DNA I have learned that before we were Arnolds we were Arrendall/ Arundel/ Arundale etc. Also someone match us whoes most distant relative was Benjamin Franklin Reeves of the Jasper Co. Ga. area. Also through Y-search I noticed a 25 marker match with a Cunningham. Does any of this ring any bells? Wow. Just seeing your post all these years later. My Arnils.line has been problematic..we have not been able.to fund any definitI’ve info above my great grand da Edlar Alex Arnold. There is a very loose supposition that a census from about 1860 70 might be gim.as youth but very presumptive. His history was always an unknown even to his grandchildren. He was noted to be Nativery American supposed Cherokee. Now as to the Cunningham info you referenced. In past few years have been informed that from my Lewis Line connected to Clemons who are documented in the Georgia State Archives in a birth ledger from the J F Cunningham Plantation. My 4x great grandmother ( Martha Clemons) is listed in the ledger with the several children she birthed while enslaved on the Plantation births that occurred in the 1840’same to 1852. Trying to get my unclemail or his son to do the testing. My dad and grand dad are.deceased so only these 2 males to provide the Y testing. Hi not sure if you wanted any news of my Cunningham? My mother who is Afro-Carribean from parents from Jamaica her dad surname was Cunningham and I have only just confirm 24/2/2018 that the Cunningham line does indeed come from a while male. The Cunningham where lords and Noble. All the white Cunningham family from Scotland moved to India and America and actually was close with British royalty. There never really mixed before they came to the Americas. So they very upper class. There are 3 noted Spencer Reeves. One is my Great great grandfather the other 2 are one his son and another either his Uncle on cousin. There are several Descends ts from the late 1890’s 1900 whin then also name.their sins Spencer. .I have all.the names of those siblings of my great grandmother..He then married a 3rd time this was my great great grandmother Carolyn Duval Reeves. He had several children with her. He died when his youngest son with her was very young. Sometime 1890’s. I am searching in the Anthony line. My ancestor was Sally Anthony who ended up in Taylor county, G.A. Her daughter was Leathy Lucas who married Jessie and had Laura born 1860. Please help if you can. I have been on this quest for five years. Tangela, I wish I could help, but I don’t know anything about Anthonys in Taylor County. My relatives lived in Oglethorpe, Wilkes, Washington, Madison, and that area in the northeast corner of Georgia. Do you have an Ancestry.com membership? In Washington county ga sandersville and Sparta Hancock county ga also in mcduffie county ga my great grandad name was James huff if that helps. Also I was told that a lot of slaves were mixed from these areas in georgia. Yes my dad was Herman Huff, named from his Dad. One of the brothers. The Anthony family that my family lived with were in Wilkes, Washington areas. I would imagine then that there is almost certainly a connection. The Anthony family was a very big one, and they all settled right around there. Let me troll through the archives I have: wills and such. I might be able to find something. Have you founded anything yet? No, I’m afraid I haven’t been lucky yet. I went through all the Anthony files here: http://www.gencircles.com/users/danahuff/5/bysurname?Anthony. Some have wills, but none of the wills mention slaves by name. Very frustrating. Still, that list might be a helpful starting place. Micajah Anthony? I also found a James Clark. I think these or the people that they were with. Yes, please look at the link I provided. It lists all the Anthonys in my family tree, and the names Anselm, Joseph, and Micajah crop up several times each. You need to click on each name and read what I have. However, as I said, no slaves were mentioned by name in any of the information I found. Hi I am writting the history of aerated waters & cordial manufacturers of dunedin & otago. I came across this webb, and saw the name Huff. This man William Giles Huff was in Queenstown Otago new zealand 1865-78, he owned a farm and a cordial factory with many partners, but left for the usa. This is all that i have on him, but would like to now more like were he live, what did he do in the usa, be able to get photos of him and with hope of the farm and cordial factory in queenstown, wakatipu, new zealand. i was told of a photo of a child Frank.R.Huff stamped newark, new jersey usa if this is of any help, hope to here from you cheers paul wadsworth. Hi, I think my Huff line comes from Va. But my problem is my ggggrandfather which was born in Ga. Daniel Huff in 1802, wifes last name. I believe Daniel ‘s family came from va./south carolina to Ga for the land lottery.A lot of Huff stayed but Daniel father and mother dies in 1806 and 1809. I think the Children was sent back to SC, which was Daniel and Lundy. Lundy is a family name carried down to my fathers generation. Daniel is son of Lundy and his father was Daniel and his father was william married to a Elizabeth Lundy. The Lundys have a web site listing there slaves. But my problem is I am trying to find out Daniel wife”s last name . Her first name was Matilda from SC. They moved to Ark. 1850. Does any one have this line? You have a wonderful blog! I am a descendent of African American Huff’s who are from Augusta Ga but also has ties to Waynesboro and Dearing Ga. I believe thats in Richmond County Georgia. I’ve heard that there are three sets of black Huff lines but they are all suppose to be related somehow. The oldest relative I have been able to gauge out of family members is my G.G.G. Grandfather Reuben Huff. Apparently the Huff’s owned a considerable amount of land in Augusta and sold cattle and timber. Do you know if there may be a connection? Richmond County is considerably close to Wilkes and Oglethorpe. Thanks! There could be a connection, but I am not sure. My Cunningham/Anthony/Williams families married into the Huff family of Wilkes/Oglethorpe Counties, but the connection to me would be distant. My husband’s Huffs are from Tennessee. Hi Dana, I am looking for information about my paternal greatgrandmother and was wondering if you could help. Her maiden name was Zilla (or Ziller) Ann Huff b.1868 (Oglethorpe Co) – d. about 1920 (Candler Co) She was married to Charles T Vaughn (of Oglethorpe Co died Metter, Candler Co). Her parents were George Huff & Martha Bridges. The problem I have is, I am not sure of the date of her death or where she is buried. I haven’t been to Oglethorpe Co. cemeteries and haven’t found her death certificate. I found her husband’s Death cert dated 1924 & he had remarried. Ben, I’m afraid that name sounds unfamiliar. All I could probably do is point you to Ancestry.com, and it looks like you are already working with that. My connection to the Huffs in Oglethorpe is a distant one. Still, there were a few of them at the family reunion I went to back in May, so perhaps I can ask them. I will like your help or any information you may have that can help me. My grandfather name was Nathan Huff he was born July 17, 1912. He died may 1970 in East Orange, Nj. He had 5 children. My aunt is the only one left. She have no information regarding her father. She never met her grandparents don’t believe he had siblings but it is possible. Believe his mother name was Helen, not sure if her last name was Huff or not. We also was told he half Itialian. Look of things that may and may not be correct. I will like your help with anything that will be supportive. I have done so many searches and come to a dead end. Hi Lelia. I wish I could help, but the Huffs in our family are all in Tennessee and Georgia. I have no record of any Huffs in New Jersey, and certainly none of them in the North as late as the 20th century. I wish you luck in your search. THANKS FOR THE INFORMATION ON WILLIAM AND JANE HUFF! i HAVE BEEN SEARCHING FOR 16 YEARS ON THEM. MY MOTHER BEATRICE HUFF FATHER PETE HUFF IS THE GRANDSON OF WILLIAM AND JANE! IS EASTER HUFF FROM THIS LINE OF HUFFS? Esther Huff is my grandmother and is in the line of William and Jane Huff. She eventually married my grandfather and moved to Lackawanna, NY. This blog has brought forth a wealth of information. I am so glad I ventured here on my journey looking into my family tree. Thanks all! Connie if you are in Lackawanna Huff descendant from Milledgeville Georgia ….more than likely we are kin. Are you Huff related to Hill family and Arnold.and Reeves. We have a large branch of family in Lackawanna NY Buffalo . Hi I’m looking for any information on a William/ Bill Huff dob 1873 married a Ruby Marable December 17, 1899 Oconee Co. Georgia also lived in Scull Shoals. I recieved an email from another researcher today that Williams parents could be Thomas and Mariah Huff of Oglethorpe Co. (not sure)but 1880 census show they had two sons William Huff dob 1870 & William D Huff 1873 thank you. There are many Huffs in SC. Contact the Wassamassaw tribe of Varnertown Indians. Many members of this group are in one way or another decended from a John JustuS Huff(my gr gr gr grandfather if my count is right). Another great resource that may help is a Harmon family history done by Carol Harmon. That has a public website. Google Archibald Harmon / Ridge Church to find it. I’m so glad that I stumbled upon this page! I see that I have some family members on here! I’m a 5th generation descendant of William and Jane Huff!! My Grandmother is Arlene Huff (RIP). She was the daughter of Howard “Pete” Huff and Mildred Coles. Anyway..I hope someone replies! Will send you family tree line of William Huff and Jane’s children. My name is Willie Cunningham and I recently stumbled on to this. I wanted to see if it were possible to get some more info from you. I am from Texas and as far as I know our family has lived here all our lives. It just seemed too much of a coincidence that these slave masters came to texas, set up a plantation and we share their last name. Hi Willie. It is possible there is a connection, but keep in mind that the Cunningham family moved to Texas some time in the 1870’s or 1880’s. They have never owned a plantation, and certainly they didn’t own one in Texas, especially not one run by slave labor, as slavery had been abolished by the time they moved to Texas. It is possible, however, that former slaves moved to Texas along with the Cunningham family. Johnson Franklin Cunningham, profiled in this blog post, remained in Georgia, and I think it more likely that any other former slaves would have also remained in Georgia, but I certainly don’t know that for sure. In terms of providing more information, I am happy to try to help, but I have shared what I know on this site, and I’m not sure I could find out much more. There was a J.F Cunningham Plantation. It was involved with slave labor. There is a Georgia State Archive Document with a birth ledger showing an Enslaved Woman Martha Clemons with several of her children birthed during Slavery. Dates 1840′ to early 1850’s. Martha Clemons is my 4x GreatbGrand Mother noted on that J F. Cunningham Plantation. I am looking for the Huff family that belongs to my Great Great Grandmother Dicy Daisy Huff who married Eligah Reed in Jackson County kY.we are not sure who Dicy’s parents were.A lot of our Reed family came from NC.She was born 1863 in Jackson County Ky. I am very grateful to see this blog on the Huff Family. I would like to contact Vee or ask her here. My GGGF is Simon Reeves from the same area almost. I am wondering if he is one of the sons of William and Jane Huff. He is reported to have many brothers and one is Singleton. He is found in 1870 in Pike County Ga. with wife Elmira and children. If anyone knows or has any relative information, thank you for responding. Hello Reeves is a separate.line from the Huff. Yet I.am.related.to both. I will contact you . I am a Reeves descendant from.this line. Rosetta Reeves daughter of Spencer Reeves. Spencer the brother of Singleton and many others.. I also have a historical document you would be interested in knowing about. Bar Azor 1876 Back to Africa Journey. maybe some native American. I’ve started doing some heavy genealogy and came to a dead end with Mathew Huff born in Carroll County, Va. He was raised by his mother? grandmother? Francis (Fannie) Thompson Huff. It is speculated that her daughter is his mother as Fannie’s husband, John, left her in 1802 and Mathew was born in 1809.
they certainly look mixed to me. That and the “Black Dutch” business are good evidence. Does anyone have any knowledge of this? John Huff’s parents were Samuel and Mary Huff. I am also a descendant of William and Jane Huff via the line of Louis Huff. Hello you would be related to me. I am Catherine Huff’s descendent. Louis Huff was my great great grandmother Catherine’s brother. Thank you much for this kind and thoughtful site. Much appreciated. While I do not belong in any direct way with your Huff’s I thank you for allowing me to interject my personal Huff’s here in the interest of genealogical research. I have no doubt that the TN/GA/NC/SC Huff’s are all interconnected. After years of research I’m finding evidence that whether they came to America from Germany or by way of the British Isles I firmly believe that at least two of the three supposed documented immigrants were blood connected. My posting here is to ask you if you would be so kind as to alert Brenda Huff Carson who posted here back in October of 2009 to please contact me. We are related if she in fact descends from William and Elizabeth Lundy-Huff from Brunswick CO, VA. I have a lot of information about this line. I am desperately looking for information about my grandfather, James Elvis Huff who it seems was born in Missouri but he married my grandmother, Jessie West, and settled in Gibson County Tennessee. Any information will be appreciated. His father was William Huff. I also would love to find ANY on James Elvis Huff. He is my great grandfather. Thank you for this information. My Huff family origins were concentrated in the Oglethorpe/Clarke County Georgia area. It has been difficult to trace my lineage beyond my grandfather, William Henry Huff, and his mother, Louvenia (Benie)Huff (or Hill). It is believed that she was born in Virginia as a slave and may have been later owned by the Hill Family in Georgia. It is believed that there was a connection to a Judge Hill. I have been reading through the submissions here and have found some of them very interesting as they “almost” seem to connect to the Huff name in my family–but not quite. I am hoping someone might be able to add to what I know about Samuel L. or J. Huff. My great grandmother, Mary Melissa Prince married first to Robert King. He died in December of 1864 as a Prisoner of War in Indiana. Then very shortly after, on February 22 of 1864, my great grandmother married J. S. Huff in Dalton, according to the marriage records of Whitfield Co. GA. The marriage took place during a major Civil War skirmish in Whitfield Co. GA.
We know that Samuel Huff died as a result of the Civil War because he is named with Mary M. Huff in the 1890 Widows and Survivors Census of Oklahoma. Did they marry just before he died, or did he go on to fight another day? If this is the same Samuel Huff as served the Confederacy in Company A of the 4th Battalion, Sharp Shooters, he was missing on February 29, 1864 in Dalton, Whitfield Co. GA and then considered “missing” after March of 1864. It would be tempting to think that he just did not go back to war after the marriage but he may have died. Samuel Huff used the middle initial “L” in his service record and also in the 1864 deed record in which the children of Wiley Prince (father of Mary Melissa) of Cherokee Co. NC transferred land. It would appear that Samuel L. Huff is his correct name. Why then did he use different initials on his marriage record? Was he running? Then, to confuse matters more, there are tax lists for (Dalton), Whitfield Co., McDuffie and Warren Counties, GA in which Mary Melissa Prince King Huff gives her name as Mrs. S. J. Huff. There were four tax lists and they were dated from 1873 to 1890. It would appear that Samuel L. J. Huff was dead by 1873 as it was my great-grandmother who was named in the record. I will add that the Tax Lists in McDuffie Co., were in Dearing. We know that Samuel Huff enlisted in Augusta, GA so I feel sure he is connected to the families in McDuffie and Warren Counties. But I have yet to find him in a census or find any clue as to his parentage. I imagine he was born in the 1830’s as was my great grandmother. Does anyone have information regarding this Samuel L. J. Huff? This last comment was intriguing to me. I am descended from the African American Huffs and Hobbs families in Dearing, Georgia and am trying to find out more about them. My father was James Theodist Huff, born in 1915 in Shellman, Georgia. His father, Frank Alfred Huff, was the grandson Samuel Huff and Missouri (Hobbs) Huff, all of Dearing, Georgia. After my grandparents separated, my grandfather went back to McDuffie county to live. Since a lot of slaves were named after slave owners, I am sure they were slaves of the Huffs and Hobbs families that settled in Dearing, Georgia. From information found in Ancestry.com, some Huffs formerly lived in North Carolina before moving to Georgia. Could your Samuel be the slave owner? Are any slave names listed in the tax records? This would be very helpful to me. Thanks. I just found out that Missouri(huff)Hobbs is my great great great grandmother. Her daughter Penny married Albert Wilkins and they are my great great grandparents. I was told that Missouri married someone named John Hobbs though. They are all from Dearing Georgia and the Huff, Wilkins and Hobbs family seems to be all interconnected. Does anyone have any information on the white side of the family. I think it would be fascinating if there could be a connection found. Hi Joseph, we seem to be from the same lineage also. Penny is my great, great, great grandmother. I am a descendant from her son Isham (Isom, I.H.) Huff. Please contact me at jiburili@verizon.net. I made contact with Kathleen this week also initially through Ancestry.com. I just bought a book about the Hobbs and related family genealogies that Cleon helped me find. On January 7, 1845 Moses Hobbs sold a young slave woman about 18 years old named Missouri to George M. Huff. She would have been born about 1827. Moses Hobbs was a son of David Hobbs. George M. Huff was a recipient included in the disposition of David Hobbs estate when he died. He must have been a close relative, perhaps a nephew. The Huff, Hobbs, and Bradshaw families in the McDuffie, Warren, and Columbia counties were closely connected through intermarriages. All of Missouri’s children were called Huffs. There appears to be no marriage record anywhere for her yet the name of the father listed on the death certificate of my GGrandfather, Sam Huff is John. I believe either all or some of her children were fathered by the Huff slave owners or their male relatives. The name of her sons correspond with the names of the Huff men in that family and the names are repeated through the generations. Kathleen Olakunle and others from the Huffs of Warren and McDuffie Counties in GA. I am a Huff descendent from George Middleton Huff’s brother, Rev. Jonathan Huff. I would love to connect with you and share information, even though my line is a mystery in itself. Happy to meet cousins! My Great-Great Grandfather was Daniel Huff of Brunswick County, Virginia, at the time of emancipation, he owned 47 slaves. Hey Joe do you have an email I am related to the Huffs in Dearing, Ga and my great, great grandmother was apache Indian. Her name was Pattie Hampton. I am doing research and really want to know more about my Huff family!! Dana, I have Information that you will find relevant. I am a Huff descendant and habe detailed I do as is noted in my Blog Georgia on Mind: http://milledgeville'sborguslewisfamily.wordpress.com. I also have additional information re Cunningham plantation documents. On the blog site you can inbox me your contact info or friend me o. Facebook. I am absolutely amazed to find you all. I just traced my family’s history today and it led back to Daniel Huff and the Pea Hill Plantation. Believe it or not, my family KEPT THE NAME!!! My grandfather’s name is Daniel S Huff, great-grandfather is Stark Daniel Huff, and his father is Daniel Huff, etc. Crazy to find all of you! Do you ever meet in person? There are quite a lot of us in Ohio although I moved down to Atlanta. My Great-Great Grandfather is Daniel Huff, owner of Pea Hill Plantation. Oh wow, I missed your post back in August. Very nice to meet you! Have any of you ever used the 23andme DNA test? It’s a lot more detailed than ancestryDNA and tells you where your bloodline originated from. All the sources. It would be great if we all could link up through out DNA. My great grandfather name is Seaborn Huff out of Jefferson county,Georgia. My grandfather is Lawson Huff,he lived in luling,TX. Seaborn was born in 1834, Lawson was born in 1870, my Dad name was Homer Huff, born 1898, he was a elder man when I was born.